U.S. President Donald Trump has threatened "major sanctions" against North Korea after it tested a missile capable of reaching much of the United States. Trump wrote on Twitter that he spoke with Chinese President Xi Jinping about North Korea's latest missile launch. He said that "additional major sanctions will be imposed on North Korea today." U.S. Secretary of State Rex Tillerson said the United States has "a long list of additional potential sanctions, some of which involve potential financial institutions." 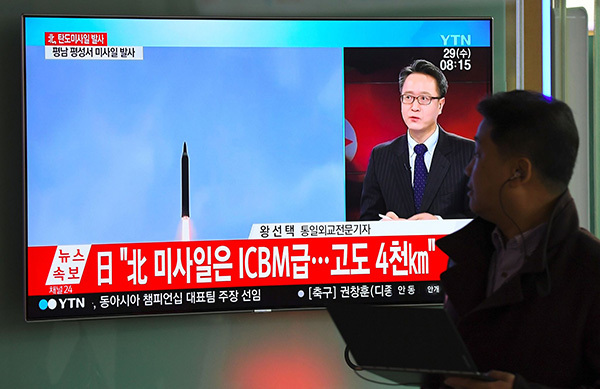 North Korean state media reported that the intercontinental ballistic missile is capable of striking the "whole mainland" of the U.S. The missile could be armed with a "super-large heavy nuclear warhead." The missile was launched at 3:17 a.m. on Wednesday from North Korea – or early Tuesday afternoon in Washington, D.C. It reached a height of 4,475 kilometers and traveled 950 kilometers before landing in the Sea of Japan. State media reported that North Korean leader Kim Jong Un declared that his country has achieved its goal of becoming a "rocket power." After the launch, U.S. Defense Secretary Jim Mattis said the missile test "went higher, frankly, than any previous shot they have taken." He added North Korea is continuing to build missiles that can "threaten everywhere in the world." American scientist David Wright has been following North Korea's missile and nuclear program. He wrote a blog post about the missile test for the Union for Concerned Scientists. "Such a missile would have more than enough range to reach Washington, D.C., and in fact any part of the continental United States," Wright said. South Korean President Moon Jae-in said he is concerned that North Korea's missile threat could force the U.S. to attack the North. Moon said at an emergency meeting in Seoul, "We must stop a situation where North Korea miscalculates and threatens us with nuclear weapons or where the United States considers a preemptive strike." Moon has repeatedly said the U.S. cannot attack the North without Seoul's approval. But the U.S. may act without South Korean input. The North Korean missile test came a week after the U.S. added the country back to a list of countries supporting terrorism. The White House said Wednesday that in his call with President Xi Jinping, Trump spoke about the need for China to urge North Korea to "end its provocations and return to the path of denuclearization." China's state-run Xinhua news agency said Xi told Trump that China remained determined to clear the Korean Peninsula of nuclear weapons and to keep peace and stability in Northeast Asia. You have to admit that you are, in fact, in difficulties. 5.The missile could be armed with a "super-large heavy nuclear warhead." The pirates were said to be armed with guns and rocket-grenade launchers, and some escaped on speed boats. The youth should be armed with knowledge. 6.China's state-run Xinhua news agency said Xi told Trump that China remained determined to clear the Korean Peninsula of nuclear weapons and to keep peace and stability in Northeast Asia. We are determined to get the work done before New Year's Day.